Sir Arthur Conan Doyle was one of the most famous people of his time, the fame garnered through the adventures of his fictional detective Sherlock Holmes even leading to knighthood. As a consequence, he led a life almost as interesting as his creation. 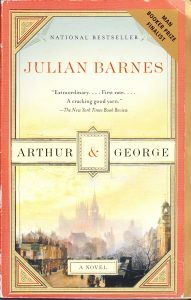 In Arthur & George, Julian Barnes explores that life, particularly in the context of how it crossed paths with one George Edalji, the son of a vicar who also happened to be of Indian descent. George is a normal, quiet, if odd, boy, who grows up in rural England. He perseveres against his bad eye sight and overall reserved character to eventually become a solicitor or lawyer. However, as George’s life becomes complicated, Arthur is eventually drawn in as a real life manifestation of his creation Sherlock to solve the mystery of George’s trouble. The novel, while fictionalized, is based on true events in which George and his family are the targets of local persecution. While it is never stated why, there are hints that their Indian heritage makes them outcasts in rural England, though George himself never accepts this to be the case. In the lead up to their lives crossing paths, Arthur has his own life, full of adventures and romance. Particularly engrossing is his relationship with his wife, especially after she becomes ill. I won’t spoil it here, but the inner conflicts that Arthur endures go a long way to showing the nature of his character. This is where Arthur & George shines, in the development of these two characters, Arthur and George, delving deep into their psych and their motivations. There is no big international scandal or reality-destroying threat on the horizon, just the deep insight into the lives of two men who briefly cross.